Twitter can be a game changer for many brands, both in a positive and negative way. ESPN Mobile was the beneficiary of the positive yesterday, as several thousand of the IBM Lotus Software faithful gathered in Orlando for a small annual conference called Lotusphere. Attendees spend the week getting excited and rejuvenated about their software platform. The only downside for some is that the opening reception beach party is always taking place at the same time as the late NFL playoff game. Before mobile applications really took hold in the past few years, fans who wanted to watch the game would skip the party and head for to the ESPNZone restaurant on the Disney Boardwalk to catch the game. Even with mobile apps, people still do the same thing. But not all. The emphasized words are words that look like they could have been written by ESPN public relations types themselves. But they were not. In addition, because he used the hashtags of #ls10 and #lotusknows, it means that this tweet reached a probably audience measuring in the thousands world wide, thousands following these hastags. Not only that, because he used #fb tag, it means this tag also went to his Facebook status. This is the type of advertising that cannot be bought, and it is probably hard to measure the effectiveness. If he had included a link to where the app could be downloaded, then perhaps it would have been measurable. But that was not likely to happen at a beach party. 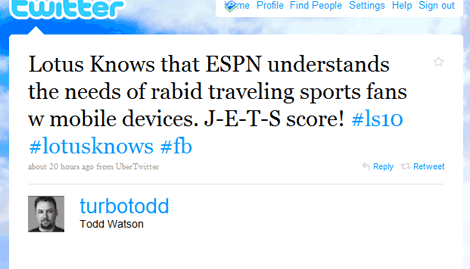 So maybe ESPN might want to think about giving him a gift certificate to the ESPNZone restaurant for a free meal. After all, he did a lot for them with just 14 keystrokes.